After dying in 2014, the original Wolverine is back in the pages of Marvel Comics, but he’s not making his presence known to his old friends and enemies. Instead, he’s forcing them to come looking for him, and the Hunt For Wolverine unfolds in four new miniseries, each exploring a different genre: action-adventure, dark romance, crime noir, and horror. Claws Of The Killer is the creepiest book of the bunch, with writer Mariko Tamaki and artist Butch Guice bringing Wolverine’s greatest foes together in a grisly superhero nightmare. 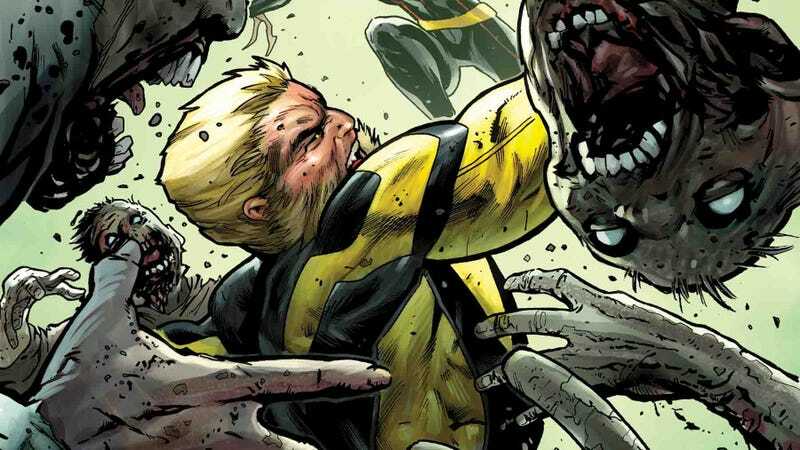 Sabretooth, Lady Deathstrike, and Daken all have their own personal vendettas driving their search for Logan, and it leads them down a terrifying path paved with violence. “This is a very extreme version of a rag tag group,” says Tamaki. “Generally speaking this is not the kind of group that would pick each other for a leg of The Amazing Race. They would probably rather just slice their competitors in half than compete. That’s their deal. So teamwork is an awkward set up. They’re all incredibly distinct and strong personalities, crazy and unmanageable in their own ways. These characters are all wary of others and also unrelenting. So it’s...intense. These miniseries may focus on Wolverine, but they spotlight a wide range of characters, making this an event with significant ties to the larger Marvel universe. “We tasked all the writers of the Hunt For Wolverine stories to look back at old X-Men stories and give us a few ‘WTF? !’ moments we may have missed, and what they came up with surprised even me,” says Marvel editor-in-chief C.B. Cebulski. “Dare I say a few familiar faces make their return? A few old wounds get reopened? Certain romances are rekindled? And if I can drop one hint: was Vulcan the true third Summers brother?! Now I’ve said too much; I don’t want us to get to ahead our ourselves because this is a Wolverine story after all, right? !” Hunt For Wolverine begins with an oversized one-shot on April 25, and Claws Of A Killer debuts on May 16 for readers that want to see the scarier side of this superhero story.